Burt's Bees All Aglow Bronzer Stick instantly illuminates your skin as it brightens and defines your face. The Golden Shimmer shade enhances your skins natural sheen while providing a long-lasting sun-kissed glow. Made with ingredients, the combination of moisturizing coconut oil, jojoba oil, cupuacu butter and daikon radish extract nourishes and hydrates skin for hours. 100% natural, this Bronzer Stick applies smoothly and blends easily without the heavy and cakey feel. The lightweight and non-sticky formula is hydrating and long-lasting giving you healthy-looking skin. Get that youthful look with nourishing, skin pampering ingredients that care for your skin and does not settle into lines or wrinkles. Apply the bronzer to your cheekbone, brow and nose to enhance your complexion. This bronzer is dermatologist-tested and formulated without parabens, phthalates, SLS, petrolatum or synthetic fragrances. Add natural highlights to your skin with Burt's Bees All Aglow Bronzer Stick. Instructions: Apply the bronzer stick to your cheek bone, brow and nose for extra emphasis. I really like this highlighter a lot! However, the color doesn't really show up too much on my face I think this is in part of the middle of the stick has a moisture circle. So you are getting most of that upon application unless you tilt the highlighter stick. Speaking solely for myself, I am 38 with medium toned skin and I feel that after my makeup was on and I tried to apply the highlight that because of the moisture circle it made my cheek look like it was more wet than highlighted. And then with minimal blending I felt like it was taking off my makeup underneath. I'm not really sure if you are even supposed to put it on top of makeup or just put it on a bare face. So I personally have opted not to use this in conjunction with makeup but use it on days when i'm not wearing makeup and want to run errands and have a summer kissed look. For that reason I think the moisture circle in the middle is perfect as well. It says that this product is made with 100% natural ingredients such as moisturizing coconut oil, jojoba oil, cupuacu butter and daikon radish extract to nourish and hydrate skin for hours. So this is important to me and I appreciate that it's an all natural product. I will definitely keep using this product. I do like it a lot on a bare face but just do not like it in conjunction with makeup on myself. I will say the shimmer is more subtle and not over powering at all once blended in. On my skin it is almost barely there but again, that is also appreciated at my age. I really rather not have a drenched full on glamour shimmery highlight drawing attention to my skin. I will be purchasing the bronzer to try next and am hoping it will be another subtle wearable item for non makeup days. Two beauty perks in one! This color looks very dark and made me worried that I chose the wrong color. Thankfully the color is very light and sheer. It is a lovely shimmery gold. It is moisturizing and goes on soft and smooth. The only downside is that if you put it on over foundation it will take it off. It is nice for a sunkissed look however. I like the idea of a 100% natural bronzer stick. With body bronzer creams popping up, having one for the face only seems natural. It has coconut oil, jojoba oil, cupuacu butter and daikon radish extract and with these ingredients your skin should stay moisturized for hours. One down side is that it doesn't smell the greatest. It says that it instantly illuminates your skin as it brightens and defines your face as well as enhances your skins natural sheen while providing a long-lasting sun-kissed glow. I agree with that to a degree. I already have a bronze complexion and I was hoping that though it would maybe blend invisibly into my skin with the end results being a nice glow. But I was wrong. When you apply it you have to blend it into the skin and when I do that it simply disappears, as my before and after photos show. To see it better in the photos I decided to use it on my chest. I figure that if your complexion is anywhere near bronze this particular color might not be the one for you. If this bronzer did show up on my skin I would have used it everyday because it goes on silky smooth, as advertised, and since you don't need much it should last a while. It is also so lightweight that it felt like I had nothing on my skin at all. It's worth a try so long as you choose the right color. 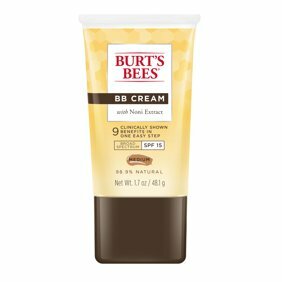 I love anything Burt's bees especially this bronzer stick. It's so easy to use and takes up minimal space in your makeup bag or purse. The color matches well with my skin in the summer but I believe come winter I'll be a little to pale for it. It is easy to apply and feels good on my skin.